Marines of 2nd Platoon, Mike Company, 3rd Battalion, 7th Marines Regiment, First Marine Division killed in defense of Hill 25 on 2 November 1967. Marines from 2nd Platoon, Mike Company, 3rd Battalion, 7th Marines Regiment, First Marine Division wounded in action/evacuated to1st Med Bn in DaNang. Three that were lost. 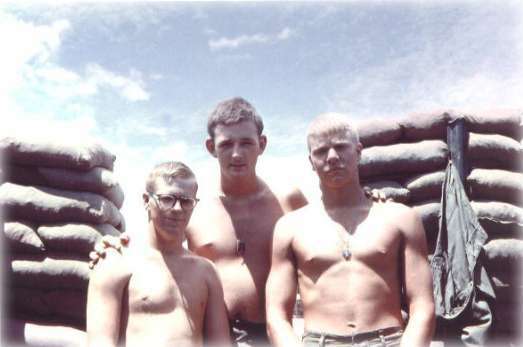 Davis on the left, Glen Douglas Bates in the middle and Willet Rankin Amendola on the right. Glen "Tex" Bates received the Bronze Star for his service in the mortar pit that night. "Will" Amendola received the Navy Cross for his courageous defense of the mortar. Marines from 2nd Platoon, Mike Company, 3rd Battalion, 7th Marines Regiment, First Marine Division wounded in action/not evacuated. Thanks to Doc Hanmore for the names of the wounded/evacuated, and Vic Vilionis for the names of the wounded/not evacuated.